EATABLE handbags and accessories are made of biodegraded materials, such as vegetable tannin leather, solid block wood, linen thread, seaweed glue, and bee wax for treating leather and wood. 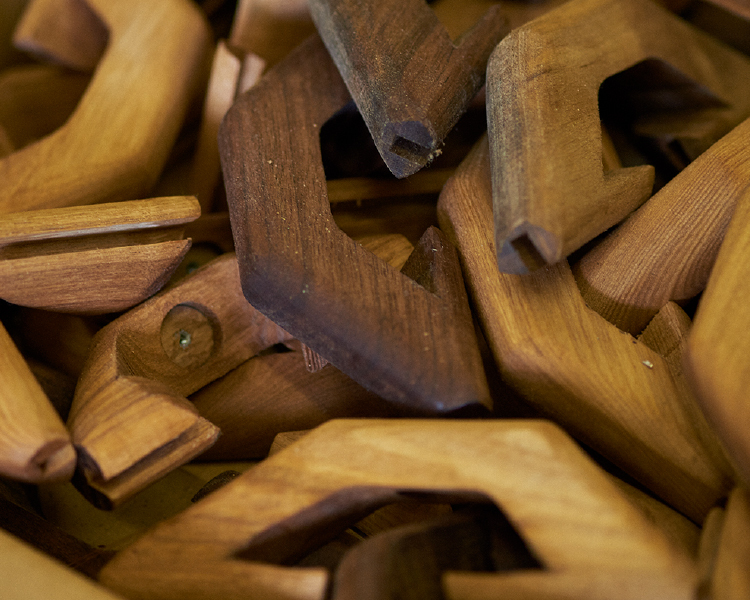 The fact that all wooden parts are designed and produced one by one in-house builds the core to the brand. EATABLE picks the materials to care for the ecological footprint, but because all material is from nature, it adds uniqueness and joy to the products. 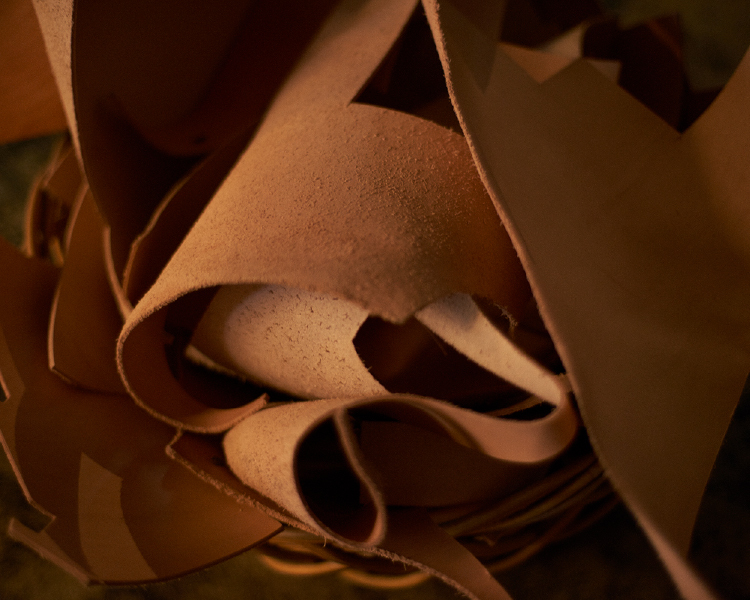 EATABLE uses vegetable tannin leather for its flexibility, durability and biodegradability. Over centuries, man fine-tuned the method of adding durability to animal skins by soaking them in oil extracted from plants. The vegetable tannin leather develops a patina and ages beautifully over time. Today, it is common to use chrome tannin leather which is easier to produce leather with less production time and cost, but the use of chrome harms sustainability, so we don’t use it. EATABLE uses cow, sheep, deer, and pig skins for various parts in our hand bags. All materials are taken from edible animals or animals that could not go beyond difficult season. Without any compromise, leathers are carefully selected and processed to help realize product concepts. Some product requires a certain thinness of leather, softness, or shrinkage. EATABLE has the know-how to realize this in-house. The cowhides are used for our signature “Hanger bag” series for its strength, durability and moldability. In order to realize the unique spherical shoulder form, leather is formed with our unique know-how of leather molding technique. “Hanger bag” series represents all the EATABLE craftsmanship. Without the support of any synthetic materials, EATABLE breathes new life into leather in the form of bags and accessories. The softer animal skins such as sheep and deer are used for “Tin bag“ series which has our original wooden closure on top of the bags. The softness and durability of sheep and deer are suitable for sewing machines. 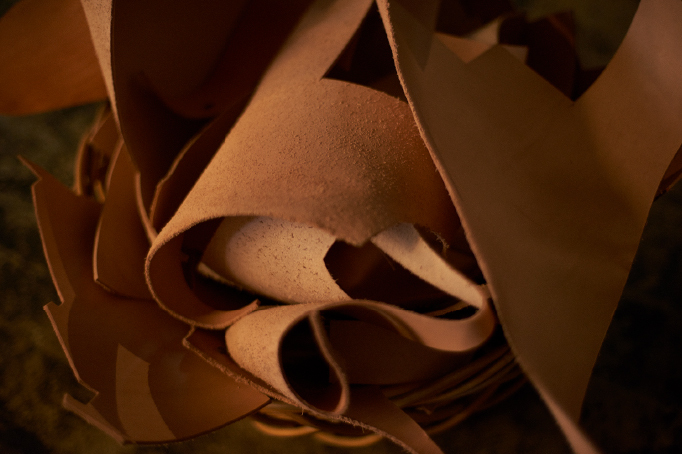 Pig skin is the only leather material that can be self-sufficient in Japan from breeding to manufacturing. It is light, breathable, strong against wear and durable. EATABLE often use it for lining of handbags. It supports various designs such us dyeing and embossing. EATABLE uses only natural blocks of wood. The material is cut from the forest, and undergoes a careful drying process of several years. Unlike synthetically glued plywood, natural wood breathes and develops a patina and age beautifully over time like vegetable tannin leather. 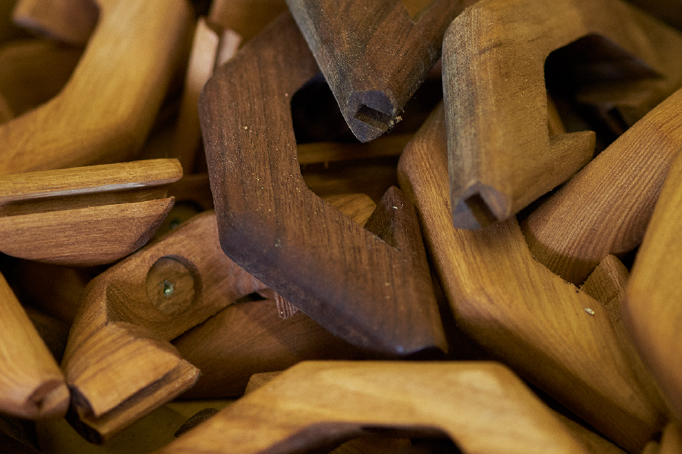 We use mainly white ash and black walnut, in addition to driftwood from Atami beach for special products.